In his 1904 short story, "The Country of the Blind," H.G. Wells tells the story of a mountaineer who falls down an icy slope in the Ecuadorian highlands and finds himself in a lush valley. There he finds a village completely cut off from the rest of civilization, where all are born blind. Trapped by impassible mountains he tries to teach the villagers about sight. But they just don't understand his fifth sense. In fact, the town doctor suggests his eyes be removed, for they seemed to be the cause of his strange malady of "sight." In the story, the villagers believe birdsong is given by angels, "whom one could hear singing and making fluttering sounds, but whom no one could touch at all." On a recent morning hike through a local nature park I walked the paths listening to the bird songs and calls of recent migrants--birds, like old friends, that I hadn't seen since last spring. It put a smile on my face. There!--the first "pit-e-rik!" of Western Tanager for the year. And now, listen!--several "whit" calls of the newly arrived Swainson's Thrushes. The sing-song warble of Purple Finches came from the firs high above. The towhees were hopping in the brush. Orange-crowned Warblers were chasing one another through the canopy of oaks, the leaves just budding out. The hummingbirds were perched on their sentinel trees, surveying the land. What's that? A little squeak. A movement of shadows in the trees. 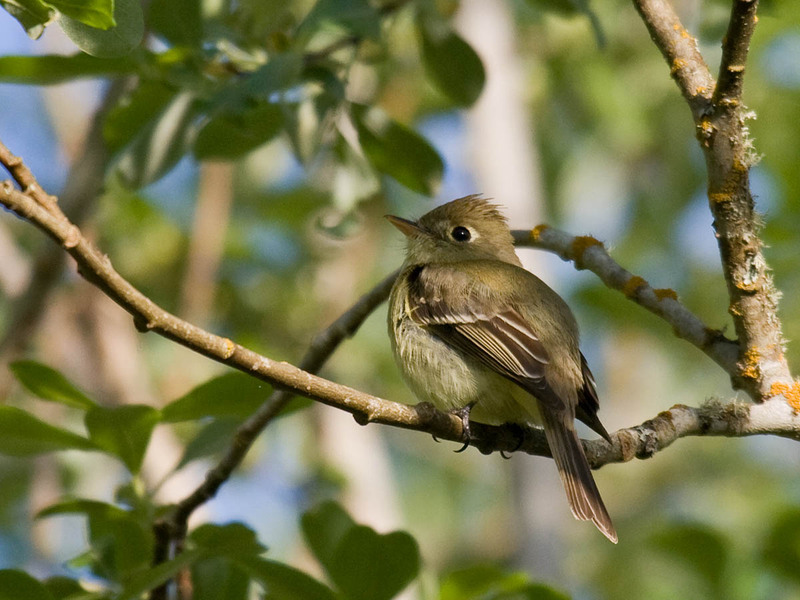 Yes, there it is, sitting briefly for a photo--a Pacific-slope Flycatcher! It was a joyous morning of birding. There were others here, as well. A jogger was enjoying his morning run, wires from a radio running into his ears to drown out the voices of nature. A woman talked on the telephone, handling a few early morning business questions while she walked briskly. Another couple of women were in an animated discussion about family and acquaintances, who said what, and then what did they say? I could hear them coming down the path a quarter of a mile away. Blind. Blind like the villagers in Well's story. They were blind and deaf to the angels singing and fluttering around them. It seems to me they were not just oblivious to the sights and sound of nature. The thought of listening to and watching birds must be incomprehensible to them. Each rustle in the bushes, each chip note and flight call and song, every flash of color or silhouette in the treetop, each of those things revealed to me a bird that I could identify and enjoy. Each species identified brought memories of previous encounters and travels. The other people on the trail with me lacked any such connections and memories if, indeed, their senses even brought these sights and sounds to consciousness. I suspect not. They didn't notice. They couldn't notice. The birds were invisible. Like angels that only I could see. Lucky the human who learns to listen and see birds at a young age. For many people, birding is a gift acquired later in life. A thought provoking post Greg. Each year, my birding ear gets better and better and because of it, the joy I feel at the return of each bird in its season delights the heart and warms the soul. While doing the slow-drive birding along Idaho highways with my father-in-law he'd often remark at the people whizzing by that unfortunately they don't take time to appreciate the natural beauty all around them. Birders are certainly one group that has a deeper appreciation of nature and we do see and hear more than the average person. That is a wonderful bird, and the story. This is wonderful, exactly how I feel when I'm outside. Wonderful story Greg, I often wonder how people can miss seeing the birds that are all around us, maybe they aren't fascinated by birds or nature. Who knows for sure. Terrific story! I think if people would only take the time to stop and focus in on nature, a whole new beautiful world would appear before them.